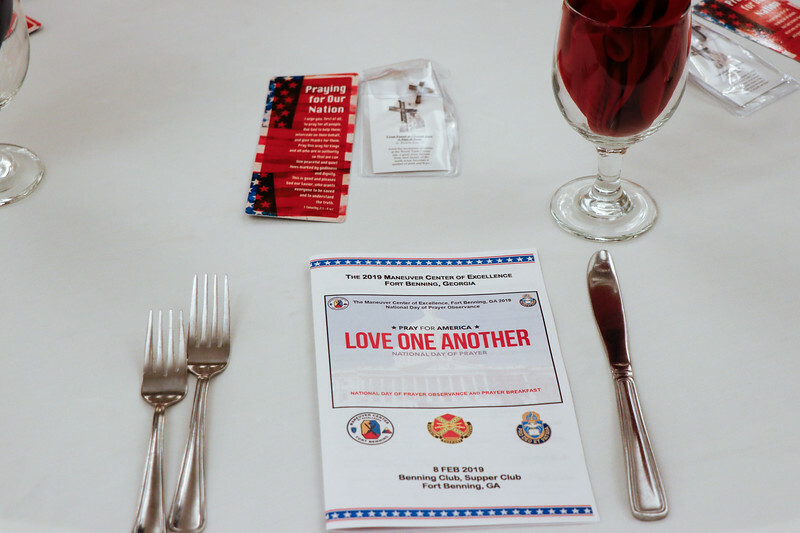 FORT BENNING, Ga. (Feb. 8, 2019) – The chaplains of the Maneuver Center of Excellence Religious Support Office hosted a special breakfast in observance of National Day of Prayer Feb. 8 at the Benning Club at Fort Benning, Georgia. FORT BENNING, Ga. (Feb. 8, 2019) – The chaplains of the Maneuver Center of Excellence Religious Support Office hosted a special breakfast in observance of National Day of Prayer Feb. 8 at the Benning Club at Fort Benning, Georgia. Retired Col. Timothy M. Karcher served as the guest speaker. Karcher spent nearly 26 years in the military. In 2009, during his third combat deployment, Karcher was leading a mounted patrol when his vehicle was struck by an explosive device, which penetrated the vehicle’s armor and destroyed his legs.